Thank you for your interest in one of Greenwood Automotive's online offerings. 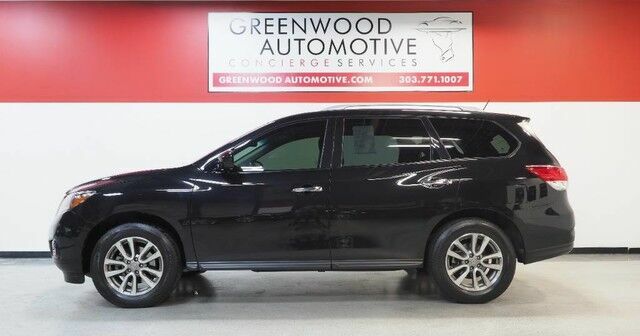 Please continue for more information regarding this 2015 Nissan Pathfinder SV with 84,941mi. Why does this vehicle look so great? The CARFAX report shows it's only been owned by one owner. With this exceptional SUV, you'll get "sport," "utility," and comfort. This 4WD-equipped vehicle will handle beautifully on any terrain and in any weather condition your may find yourself in. The benefits of driving a 4 wheel drive vehicle, such as this Nissan Pathfinder SV, include superior acceleration, improved steering, and increased traction and stability. Clean interior? How about flawless. This Nissan Pathfinder looks like has never been used. More information about the 2015 Nissan Pathfinder: Between its seating capacity and fuel economy the Pathfinder makes a good value play. While previous Pathfinders competed with truck-like SUVs like the Toyota 4Runner, the 2015 Pathfinder aims instead to compete more closely with crossover vehicles such as the Toyota Highlander, bringing more space and refinement to the market at a slight cost to seldom used off-road capabilities. The hybrid is rated at 26 combined mpg, impressive fuel economy for any SUV, particularly one that can haul up to 7 passengers. Strengths of this model include available hybrid drivetrain, competitive pricing, 5000-lb towing capacity, third row seating, Good fuel economy, and spacious interior WWW.GREENWOODAUTOMOTIVE.COM for all Photos Our Dealer Handling fee of $499 is included in our advertised price. Government fee's and licensing are additional costs. For best service and to check availability or to set an appointment to see and drive call Steve direct at 720-339-1516 or Marc at 303-552-7909 For more information. FINANCING AVAILABLE. TRADES WELCOME. *VEHICLE IS FULLY INSPECTED BY OUR MECHANIC. We are located 4 Blocks West of I-25 on North side Of Arapahoe, Behind US Bank at Syracuse St.